Holmgren: Gagne not ready to resume skating. The Flyers are still waiting on some good news. Despite early reports that veteran forward Simon Gagne may begin skating on Friday, just seven days after having a screw inserted into his fractured toe — the latest evaluations have delayed his on-ice activity. 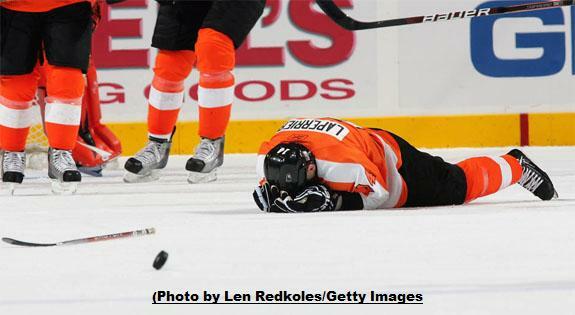 The Flyers have been uncharacteristically healthy in the post season — that is until Wednesday. According to the team, both Jeff Carter and Simon Gagne will miss Thursday’s game five against the New Jersey Devils with right foot injuries. The Flyers lead the series 3-1. Chris Pronger made his presence felt in a big way during his first season with the Flyers — and the team awarded him accordingly. The 16-year veteran took home the Bobby Clarke Award as the Flyers’ most valuable player. He also snagged the Barry Ashbee Trophy as the team’s top defensemen. Pronger is coming off one of the best statistical seasons of his career by tallying 10 goals and 45 assists in 81 games. He also leads the team in plus/minus with a plus-22 rating.